THE ISPA Expo – spa news! I spent just a bout a whole day, having planned 3-4 hours, I had truly underestimated the expo and the quality of the vendors. And I have to say there were some interesting stuff there….. LED light therapy – this is called biophotonic technology (comes form NASA as everything else) that you can apply to any part of the body by choosing either 1) Acne, 2) Anti-aging or 3) Aches and pains and you put this on for 30 minutes. Usually when seeing these types of things I just walk passed, but this one was endorsed by people that I trust, so will definitely try this device. 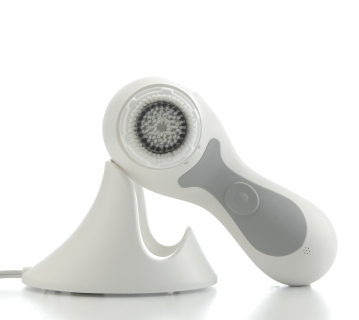 Floating bed or Relaxing swing – it is just a great idea for relaxation areas, however mythought process is that it is much easier and cheaper to build then and there, then purchase and ship it…..
Clarisonic brush – this little brush, only available in the US now, but will go international next year, works wonders for your skin. It cleanses the poores on a deeper, gentle, more effective ways than hands and helps products to penetrate deeper. Again, I heard sooo many recommendations from people on this little device, that this is something I think we will incorporate in our facials for sure! Living Earthcrafts manicure and pedicure chair – finally!!! A combined manicure and pedicure chair where you can do professional manicures. This means that we can take away the space requiring manicure tables in salons and use this all in one chair instead. Well done Living Earthcrafts! Sand therapy massage bed – a really cool bed actually with heated sand that you lie on and really relaxes you, while receiving a treatment with poultices and accupressure. 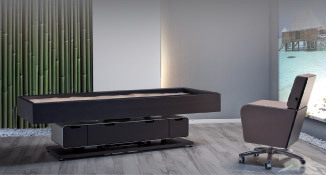 Can be used as stand alone relaxation beds or transformed with a foam to a massage bed. Might have to look into this one! So, great Expo, lots to try, have a whole pile of brochures to go through and see what are gimmicks and what actually works!